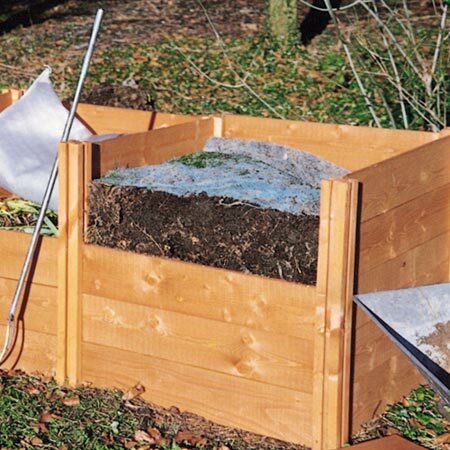 We were impressed by the design of these modular compost bins; they incorporate a host of features for keen composters! • Can be assembled in minutes - no nails, screws or holes to dig. • Slide-out panels on all sides for easy access. • 573 litres (20 cu.ft.) capacity per module. • Wood provides good insulation, while allowing the compost to ‘breathe’. • Timber is from managed forests, and treated with non-toxic preservative. You can start with one, but we’d recommend two (Bin and Module) to get the benefit of being able to easily turn the heap from one bin to the other. And when you’ve seen how well they work, you can add extra modules in the future. Size 91cm (3') square x 68cm (27") high. 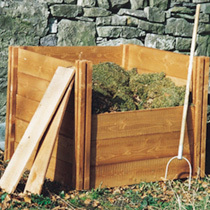 Wooden Compost Bin pack contains - 4 posts and 20 panels. Wooden Compost Module contains - 2 posts and 15panels. Can be assembled in minutes - no nails, screws or holes to dig!